The Series 636D Differential Pressure Transmitter can be used for measuring pressures of liquids, gases & vapors. All available ranges have an excellent 0.5% F.S. accuracy with a 4-20 mA Output standard or optional 1-5 VDC output. The NEMA 4 housing is an all 316 welded construction that is designed to withstand the harshest environmental conditions. With all 316L wetted materials, this transmitter is compatible with most media. These units are CSA approved explosion-proof for use in the specified hazardous locations and meet NACE standards for off-shore applications. Wetted Materials: Types 316L SS. Accuracy: BFSL: ±0.5% F.S. (includes linearity, hysteresis & repeatability). Pressure Limits: 3 x full scale differential pressure; burst: 2500 psig. Temperature Limits: Ambient Operating: -40 to 140°F (-40 to 60°C); Process Interface: -40 to 212°F (-40 to 100°C); Storage: -40 to 212°F (-40 to 100°C). Compensated Temperature Range: -20 to 160°F (-29 to 71°C). Thermal Effect: ±2% F.S./50°F (reference to 77°F). Power Requirements: 12-30 VDC for 4-20 mA outputs; 8-14 VDC for 1-5 VDC outputs, both with reverse polarity protection. Output Signal: 4 to 20 mA DC or 1-5 VDC. Zero and Span Adjustments: Fixed. Response Time: 20 ms.Loop Resistance:900 ohms max. @ 30 VDC for current outputs. For voltage outputs, minimum lead resistance 50k ohms. Current Consumption: 4-20 mA for current output models; 3 mA for voltage output models. Electrical Connections: 2 ft, 22 AWG cable; 3/4" female NPT conduit. Process Connection: Two 1/2" female NPT. Enclosure Rating: NEMA 4 (IP65). Mounting Orientation: ±0.05 psi/90° rotation from horizontal. Weight: 1.8 lb (0.82 kg). Agency Approvals: CSA approved explosion-proof for Class I, Division 1, Groups B, C and D; Class II, Groups E, F, and G; Class III. 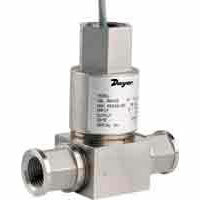 Fixed range differential pressure transmitter, range 0-6 psid. Fixed range differential pressure transmitter, range 0-15 psid. Fixed range differential pressure transmitter, range 0-30 psid. Fixed range differential pressure transmitter, range 0-60 psid. Fixed range differential pressure transmitter, range 0-100 psid. Fixed range differential pressure transmitter, range 0-150 psid. Fixed range differential pressure transmitter, range 0-200 psid. Fixed range differential pressure transmitter, range 0-300 psid. Fixed range differential pressure transmitter, range 0-500 psid.